How do you get rid of that tyre you were going to grow spuds in but never got round to? What happens to the old tyres on your car when you have to replace them to get a warrant? Why are there so many tyres dumped by the side of the road? Are the horror stories about piles of tyres being buried on rural properties or stashed under state houses true? Finding answers to these questions has revealed a looming environmental nightmare. In Christchurch the City Council charges the public $9.95 per tyre for disposal at its transfer stations. 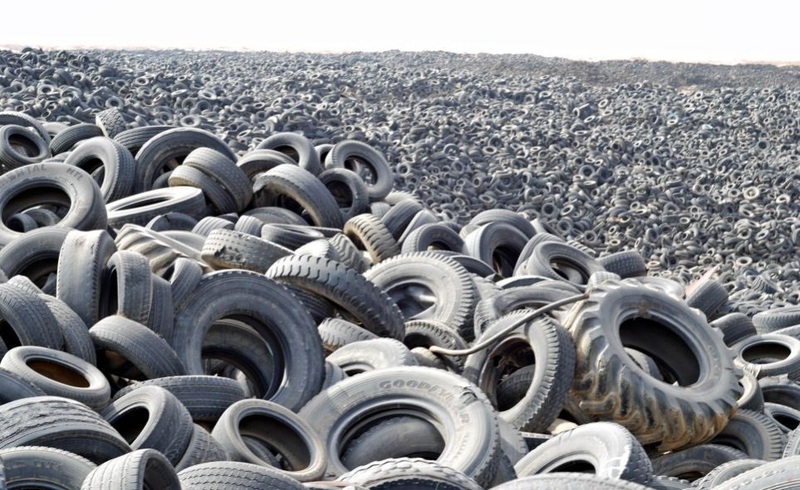 According to the Waste Management team at the council, the tyres are then shredded and shipped to India for use as a fuel in cement kilns, pyrolysis or crumbing. At the time of writing (April 2016) a request by email to Ecocentral ( who are contracted to operate the council transfer stations) for further information remained unanswered. At least one major tyre retailer in the city pays a contractor to take away their ELTs, who then bales up the tyres and exports them to India for pyrolysis. In this process the tyres are heated in the absence of air and the volatile gases and liquids given off are collected, condensed and used as a fuel. Estimates vary, but 3R claim that approximately 4 million car and 1 million truck tyres are disposed of annually in NZ, most of which are not recycled and end up in landfills or are illegally dumped. Landfill operators do not want them for a range of reasons: they take up a lot of space unless they are cut up or shredded, they degrade very slowly, and leaching of toxic chemicals has to be controlled to prevent contamination of land and groundwater. Illegal dumping has the same issues but is also unsightly, a potential fire risk and a great breeding ground for insects and rodents. Many countries, including the EU, have legislation banning the disposal of ELTs in landfills. In October 2015 Minister for the Environment Nick Smith announced the offer of funding grants for new ideas to recycle ELTs. With the rejection by the Minister of the Environment of the 3R report, the inescapable conclusion is that decades of dithering by successive governments will continue, and the piles of toxic, dangerous tyres will continue to grow. Good luck if you have a tyre to get rid of and can’t pay the $10 at the transfer station. Maybe you could bury it in the garden or put it under the house and just pretend it’s not there. (Yes, according to 3R, the horror stories are true).